Those raccoons are cute, although I don't care for the real live ones. Such friendly looking yard art! So glad you found a new friend Mary. Does she blog? Those sure beat the the live ones! Raccoons hiding in the dense population of New York. I love it. It is quite humous. And, possibly the only ones that neighborhood children will ever see outside of a zoo. They are adorable ! I want one, lol ! Doesn't exist here of course. I have to help myself with cats ! Such playful and cute faces peeking out! Oops! Well I posted my yard art anyway. How great that you got to meet a new friend while scouting for yard art! Cute critters! 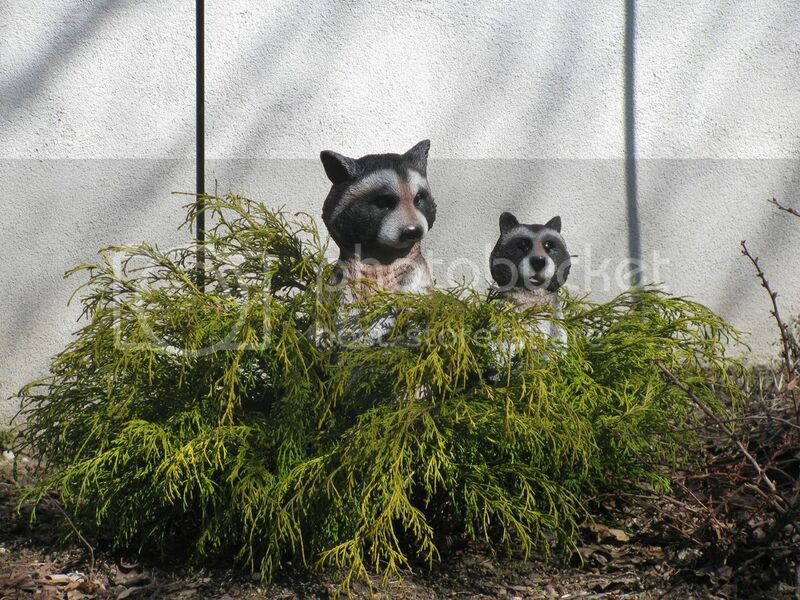 Those raccoons are great...she did a great job of placing them...looks perfect. I'm so glad I found out about your meme...I LOVE yard art...if not over done. They look as though they're quietly keeping guard over her yard. Sorry I haven't been posting any yard art- hadn't time to take any shots, but next 2 weeks (on Easter hols :) ) will make up for that! I love it when the neighbors become friends. I hate how we all seem so wrapped up in our own little worlds that the neighbors are usually strangers.